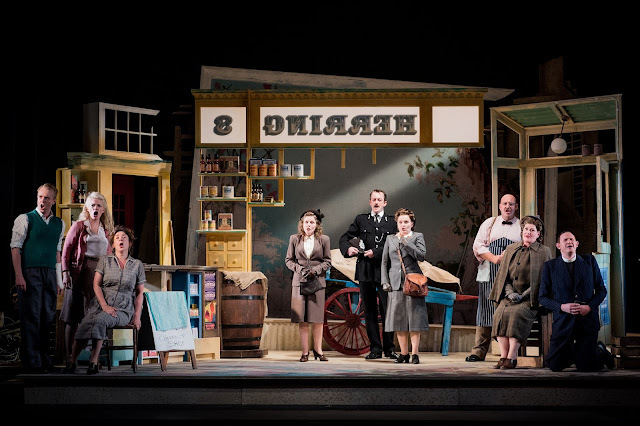 The second opera at the 2017 Buxton Festival was in complete contrast to the opening night's Macbeth; Britten's Albert Herring has never been performed at the festival and formed a suitably comic counterpoint to Verdi's tragedy. Directed by Francis Matthews (who directed last year's production of Handel's Tamerlano), the Albert Herring starred Yvonne Howard as Lady Billows, Bradley Smith as Albert Herring, Heather Shipp as Mrs Herring, Lucy Schaufer as Florence Pike, Kathryn Rudge as Nancy, Morgan Pearse as Sid, John Molloy as Superintendent Budd, Nicholas Merryweather as Mr Gedge, Jeffrey Lloyd-Roberts as Mr Upfold, Mary Hegarty as Miss Wordsworth, Sophie Gallagher as Emmie, Nicholas Challier played Harry (sung from the pit by Charlotte Trepess) , Bonnie Callaghan as Cis and Simeon-John Wake as the Stranger. Designs were by Adrian Linford with lighting by Mike Gunning. Justin Doyle conducted the Northern Chamber Orchestra. Matthews and Linford set the opera in the period of its composition, 1946/47, in the context of post-war reconstruction and change. Linford's picture-postcard set showed signs of wartime damage Lady Billows' house was not quite ship-shape; attitudes were in the process of change too. 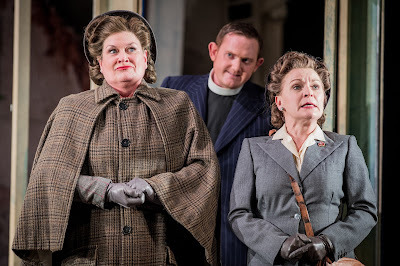 This was a beautifully observed production, with Lady Billows' rather old-fashioned extreme moralising at odds with the town worthies slightly more relaxed attitudes. This was also one of the best productions that I have seen for its careful delineation of class, with clear but subtle differentiations between Lady Billows, the town worthies and the Herrings. Linford's costumes reflected this, wonderfully in period and nicely differentiating character and class, the various ladies' shoes were a complete joy. There seemed to be some attempt to use language to show class too, but I am not sure that getting Albert to drop his T's was a good idea. Matthews had introduced an extra character, the Stranger (Simeon-John Wake) but thankfully his role seemed to be the spirit of temptation and the mechanics of the plot were untouched. Instead he egged Albert (Bradley Smith) on, and in Albert's Act 2 solo helped encourage Albert's breaking free. Yvonne Howard's Lady Billows was a beautifully observed character portrait, upright and severe with strong opinions. She was perhaps slightly less sharp-edged than in some productions, but no less fearsome, and it was the upright-ness and sense of disapproval at the change in the modern world which came over. Howard's voice was softer edged, less inclined to cut through the orchestra and without the dominating whiplash of some incarnations of the role. Instead she gave us a beautifully sung account of the role, and one which really fleshed out the detail of her portrayal. Bradley Smith was a quiet, put-upon Albert. He took a bit of time to settle, and there was a sense that the first act was a little under-projected. But the Act Two solo was engagingly touching, as the mouse starts to think about roaring, and his Act Three return was a comic delight. 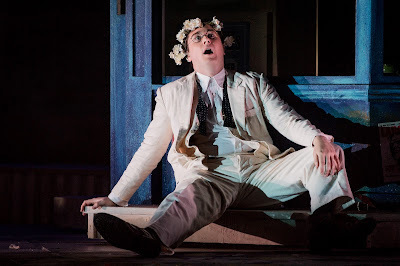 Smith has quite a slim-line, lyric tenor which he used in an elegant fashion. Lucy Schaufer gave us a strongly sung and beautifully characterised Florence Pike, slightly less the harridan, and though put-upon, full of her own opinions (indicated by a nice range of pursed-lip gestures). Schaufer's singing was superbly projected, giving a finely rounded musical account of the role. The town worthies were nicely delineated, with Matthews bringing a sense of re-thinking some of the characters. Mary Hegarty's Miss Wordsworth was beautifully fluttery but rather older than usual giving her slightly old-maid-ish hints (and she fell asleep during the Act 2 celebrations, and I wondered if Matthews was suggesting a drink problem). There was no sense of any romantic link with Nicholas Merryweather's well-meaning but slightly ineffectual young vicar. Jeffrey Lloyd-Roberts made a wonderful comic Mr Upfold, clearly a working class tradesman who constantly blundered in the mine-field of class and behaviour. Lloyd-Roberts used both his physical presence and dramatic voice to create a brilliantly different, yet wonderfully comic portrayal. John Molloy was a perfect Superintendent Budd, slow, dogged and a bit set in his ways. 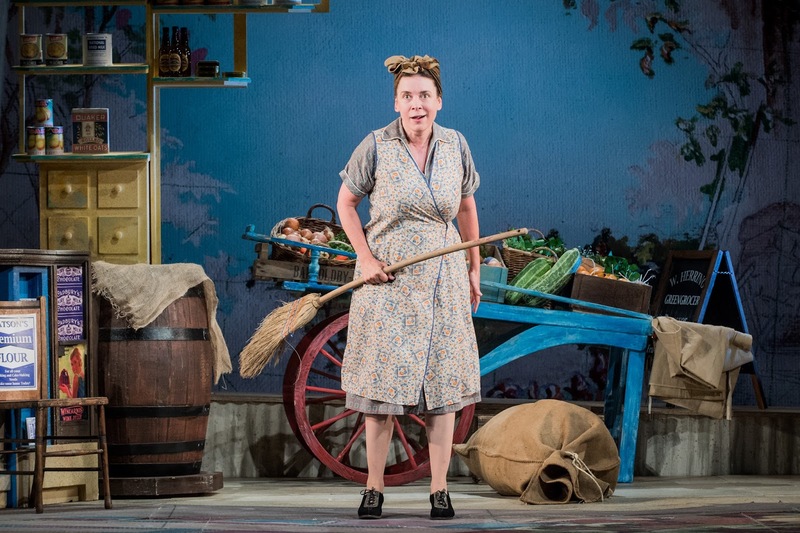 Heather Shipp's Mrs Herring was less the termagant, but firm and strong in her beliefs, clearly keeping Albert under her thumb both for his own good and because that was what was right (my house, my rules). There was also a far stronger sense of Mrs Herring's class than in some productions, yet Shipp was funny too even in the moments of Mrs Herring's extreme grief. Kathryn Rudge and Morgan Pearse formed the delightful younger couple, Nancy and Sid, the example of what Albert was missing. Rudge's Nancy seemed somewhat more mature than usual, particularly in contrast to the boyish Pearse. The suggestive dialogue between the two in the shop in Act One did rather go over the top, but the two created nice sense of established relationship. Pearse's Sid was quite the lad, but without too much swaggering braggadocio. 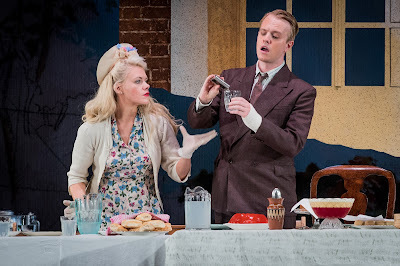 Sophie Gallagher, Nicholas Challier and Bonnie Callaghan made a lovely trio as the kids, running riot and generally charming everyone too. Challier was ill so the role of Harry was sung from the pit by Charlotte Trepess, a member of the Buxton Festival Chorus. The ensembles in the first scene were perhaps not as crisp as they could have been, and there was a sense that the production was still finding its feet somewhat. But Justin Doyle drew some strongly characterised playing from the Northern Chamber Orchestra with some fine individual soloistic moments, as well as good full sound in the ensembles. This was a beautifully observed production, using class and character to really delineate the comedy and of course, it was funny too.